Going to be a great party tonight! You can still get your tickets online- save $5 and contribute to OzHarvest, our chosen charity! Due to popular demand, this rocking night of Australian Sweet Beats and Blues returns, featuring two extraordinary bands who have played alongside some of the ‘greats’ internationally and know how to captivate their local South Coast audience. It’s an awesome party in the classic 1926 School of Arts Hall in Tomerong. Come listen, chat, have a drink, nibble, claim your space – then boogie the night away to this sassy line up of New Orleans, Chicago rhythm and blues passion and rock ‘n’ roll funky tunes. The last one went off like a rocket. The venue was packed – so don’t forget to secure your ticket. 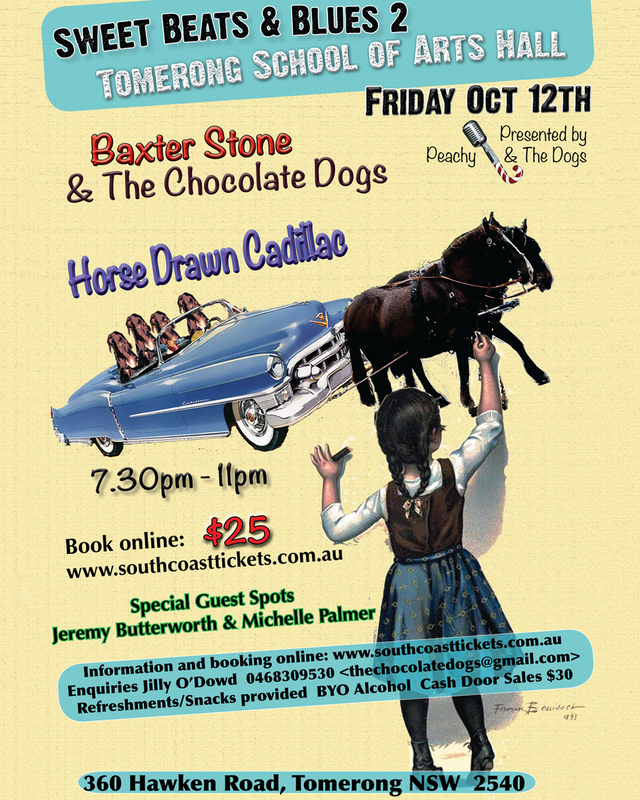 Baxter Stone and the Chocolate Dogs : Uber popular South Coast rocking band that gets every dance floor heaving. Baxter Stone on lead guitar/vocals, Jillian O’Dowd on drums/vocals, and Adrian Morgan on bass guitar. Their unique sound combines rock, blues, alt-country and rockabilly, with a touch of the psychedelic. BS & The CD’s released their album ‘Barking Up The Wrong Tree’ in November 2017, recorded with Ben Moore at the Shark Island Institute. This album has a digital release, on Spotify and Itunes, with national airplay. In February 2018, a revamped and remastered version of Baxter’s Slowburning album recorded in London was internationally released. The band members in their time have shared a stage with Icehouse, Paul Kelly, The Warumpi Band, Weddings Parties Anything, Pseudo Echo, Chrissy Amphlett and many more. This time The Dogs are joined in their set by guest artists guitar master Jeremy Butterworth (Red Eye Records – The Bhagavad Guitars ) and south coast singing Diva, Michelle Palmer for special spot performances. Horse Drawn Cadillac – feel like heading to New Orleans via Chicago on a bump n roll ride with some high octane horses? You haven’t heard this band, but you have seen them dip into this mode. HDC is ‘Benji and The Salt Water Sound Systems’ alter ego, giving the band a chance to rock the house with some favourite blues standards and hidden treasures from the deep vault of musical treasures from these great cities. Built for all on the floor! The band : Jono Dallimore and Ben Fowler on guitars, Simon Milman on bass, Nello and Mic Elderfield on sax and Nello on Mississipi saxophone, Jayda Tham adding some vocals and Will van Ekert from the Low Down Riders driving the caddy down the road. Doors open 7.30pm to sweet south coast sounds while you chat, nibble and claim your space. Cruise with Horse Drawn Cadillac for 75 minutes 8pm – 9.15pm. Then Baxter Stone and The Chocolate Dogs rock you from 9.30pm- 11pm. Your ticket includes refreshments of Mineral Water, Teas, Coffee, Sweet and Savory Snacks. Vegan/Vego friendly. Standing room only guaranteed for cash door sales on night. $30. Booking essential for a seat and your spot on the dance floor. Recommended for adults and teenagers. Email the coordinators Jilly and Baxter you wish to bring kids 12 and under -thechocolatedogs@gmail.com. They are free. We like to discuss material appropriateness for their age.